Chamaecyparis Lawsoniana Pembury Blue is most popular for its silvery blue, lacy-textured foliage which adds a brightness to the garden all year. 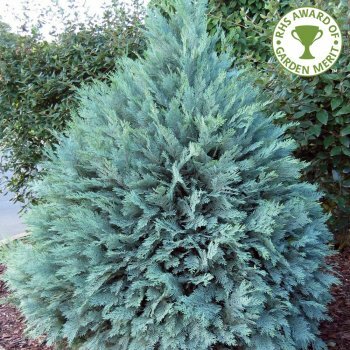 Growing into a medium sized, conical conifer of approximately 2.5 x 1.5 metres in 20 years, Lawsons Cypress Pembury Blue will suit most gardens sizes. This conifer grows best when planted in moist, well-drained soil, out of bad exposure. To encourage the brightest foliage colour, plant in sun or dappled shade, as heavy shade will affect the vibrancy of the foliage. When planting Lawsons Cypress trees, such as the Chamaecyparis Lawsoniana Pembury Blue Conifer, it is important to prepare the planting area well. Pot grown conifer trees can be planted at any time of the year. Ornamental Conifer trees do not require a lot of pruning. Simply remove any dead, diseased or awkwardly placed branches from your Lawson’s Cypress Pembury Blue tree as and when you see them.